Cold weather makes for stir crazy kids. We've been listening to lots of music and Peter Yarrow has been on rotation in the CD player (yes, we have an iPod but downloading is a lot of work so for the kid's music, we still use CDs). His folk music doesn't get them too riled up, and, better yet, they're learning some of the classic melodies I grew up singing. Today, it's all Peter Yarrow on Brimful Curiosities because that's what we've been listening to and reading! Peter Yarrow, the folk singer/songwriter from the musical trio Peter, Paul & Mary, has been making some waves in the children's book world for the past couple of years. In 2007, he published a picture book version of one of his most famous songs (co-composed with Lenny Lipton), Puff, the Magic Dragon . At the time of the book's publication, I was working as a children's librarian at a small rural library. I pre-ordered a copy thinking that it would be fun to read or sing aloud during storytime. As soon as I saw the actual book, I knew I also wanted a copy for my own home library. The cloth-covered book came with this beautiful, shimmery foil-enhanced dust jacket and inside gorgeous, full page bleed illustrations by the talented Eric Puybaret. The land of Honalee, as imagined by Puybaret, is a colorful, magical one. Puff looks very friendly and approachable, the perfect companion for a little boy named Jackie Paper. The song really comes to life in the illustrations and, thankfully, there's even a happy ending. Sad Puff isn't abandoned forever in his cave. Both my kids really like the book and, for the past couple months, my toddler son has requested "Puff" frequently. First he wants to sit and look at the pictures while I sing the song and then he asks for the CD so he can dance to the music. The book comes with a CD recording of Yarrow singing "Puff, the Magic Dragon" with his daughter, Bethany (plus a couple of bonus songs). The beautiful book could easily become a collectible, but I'm afraid ours has already experienced some wear and tear. That's OK though...after all, I'd rather see the book in my children's hands than sitting on the shelf. A worn book signals a good book. More of Yarrow's folk songs for kids can be found in his Story Songbook series. I reviewed The Peter Yarrow Songbook: Sleepytime Songs in 2008, here on Brimful Curiosities. 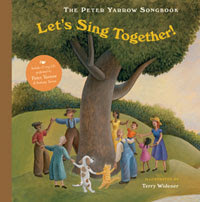 Since then we've had the opportunity to read and listen to The Peter Yarrow Songbook: Let's Sing Together! published last August. The picture book contains the lyrics to twelve familiar folk songs, and illustrator Terry Widener has created full page spread acrylic artwork to accompany each song. Some favorites of ours in this book include "John Jacob Jingleheimer Schmidt" and "Hey, Lolly, Lolly." The images in the book help my kids visualize the music, provide meaning to the lyrics and allow for an interactive listening experience. A corresponding music CD comes with the book and the back section of the book includes guitar chord accompaniment diagrams and facts about the songs. The other book in the series is titled The Peter Yarrow Songbook: Favorite Folk Songs . On Wednesday, we saw a poor, lame doe walk up to our neighbor's bird feeder. The deer's front leg was severely injured and the sight of it broke my heart. 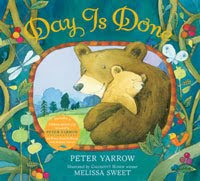 Seeing it reminded me of Yarrow's new book, Day Is Done . Images of caring animal parents with their babies grace each page, but apprehension and sorrow is evident in the text, "Do you ask why I'm sighing son? You shall inherit what humankind has done. In a world filled with sorrow and woe, If you ask me why, why is this so?" However, the refrain sends the reassuring message that the parent is there and all will be well when the day is done. At the end of the day, all is well as father and son take each other's hand and embrace. The son's bedroom is filled with toy animals and a poster of the world, implying that the little boy, with a child's outlook on life, is far wiser and loving than those much older than him. My kids aren't as drawn to this book as much as Puff, but they do enjoy looking at the adorable wildlife illustrations by Melissa Sweet. Like in all of Yarrow's books, a CD accompanies the text. Peter Yarrow is the founder of Operation Respect, an organization that works to teach school-aged kids respect and tolerance. His songbook recordings can be found in the media center free of charge so that teachers, administrators, parents and other educational advocates and practitioners can use them in their outreach. This week for our story + art craft we made flying dragons. I cut out a dragon shape from green cardstock paper. Using a mirror image paint technique, we folded the dragon in half and the kids decorated one side using glitter paint. After pressing both sides together, we had symmetrically painted dragons. The glitter glistens and feels like the dragon scales. After the paint dried, we folded paper airplanes and stapled the dragons to the top. Voila, a flying dragon. Ours don't exactly glide but fly erratically, sometimes performing loops then crashing to the ground! (Interested in more Puff activities? A Puff Activity Kit is available as a downloadable pdf here: www.sterlingpublishing.com/file_download/43). Post what you've been reading each week with your kids at Mouse Grows, Mouse Learns. A Mommy's Adventures hosts the "stART" meme (Story + Art) each week. Hope Is the Word hosts a Read Aloud Thursday link-up as well and Amy at Keeping up with the Schultz Family hosts Round Robin. I am an Amazon affiliate and may receive a very small commission for products purchased through my Amazon links. I love that story and all of the new books too. Come link up today and show of your great project. I would love to have you.. Thanks for sharing this great book! Love how your project turned out! Thanks for stopping by and linking up. I hope you enjoy your time at the Round Robin..
Wow! That is a very cool craft. My youngest is afraid of dragons right now, so it would probably be her worst nightmare - but once, she's over her anti-dragon phase, we'll have to revisit that one. Hey. I just wanted to say thanks for commenting on my post. Three cheers for happy endings. (Though I have to say Puff the Magic Dragon, the song, at least, always gets me kinda weepy!) I love your craft! We're definitely trying that! How beautiful, both the books and your project! Like Madelyn, I cry for Puff. Thanks for sharing! I grew up listening to my papa sing Puff the Magic Dragon, so I was thrilled when it came out as a pb. 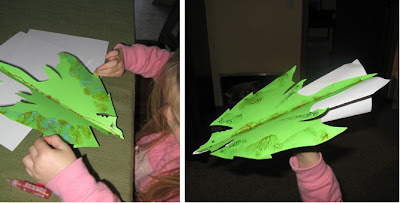 Love the paper dragons craft idea! Love the idea of showing a coordinating craft with the book. Very helpful. That's a neat craft. We just learned a new paper airplane technique at the Museum of Flight, and I think it could definitely handle a dragon passenger. We'll try it out! (I found you through the comment challenge, btw). 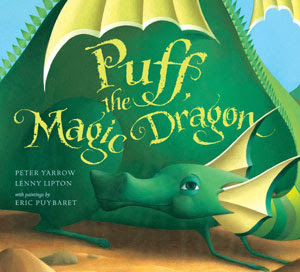 It is so nice to see `Puff, the Magic Dragon` and `Let's Sing Together` mentioned. It has been a long time since I've heard about ole` Puff and I just wanted to sing when I saw "John Jacob Jingleheimer Schmidt". What a fun review you have here. These books sound like fun. I'll have to add them to my collection at my Elementary Media Center. I am a long-time fan of Peter, Paul & Mary (in fact, their's was the first album I bought when my parents finally got a record player that could play 33 1/3 LPs). Thank you for reminding me about Puff the Magic Dragon,and Day is Done. I will have to look for these to share with Selena! What a fun post! I'll have to keep this title in mind for sure - we haven't read it yet. I like the cover art on it (Puff) very much. That is so cool! I loved that song as a child, I will have to check out the book. My son would LOVE that craft! Since I come from a different culture, it's hard for me to know and appreciate English songs. Books make them more appropriate sometimes. But for whatever reason I thought that Puff the Magic Dragon had something to do with drugs? My daughter is also in anti-dragon phase now, but maybe later we will visit this book. Very NICE craft! Great job!